Attleboro, 51 @ Franklin, 63 – Final – Click here for a recap of this game. Canton, 51 @ Foxboro, 55 – Final – Click here for a recap of this game. King Philip, 39 @ Mansfield, 58 – Final – Click here for a recap of this game. Taunton, 62 @ Oliver Ames, 59 – Final – Click here for a recap of this game. Stoughton, 68 @ Sharon, 61 – Final – Stoughton junior Cam Andrews scored a career-high 28 points to pace the Black Knights to their first win over Sharon since January 2013. Stoughton held a double-digit lead at halftime (35-23) but Sharon cut it to five (49-44) entering the fourth quarter. The Black Knights outscored Sharon 7-3 over the final two minutes of play. Ricardo Ripley led the Eagles with 19 points while Malik Lorquet added 13 points and Jimmy Fitzhenry had 12 points. 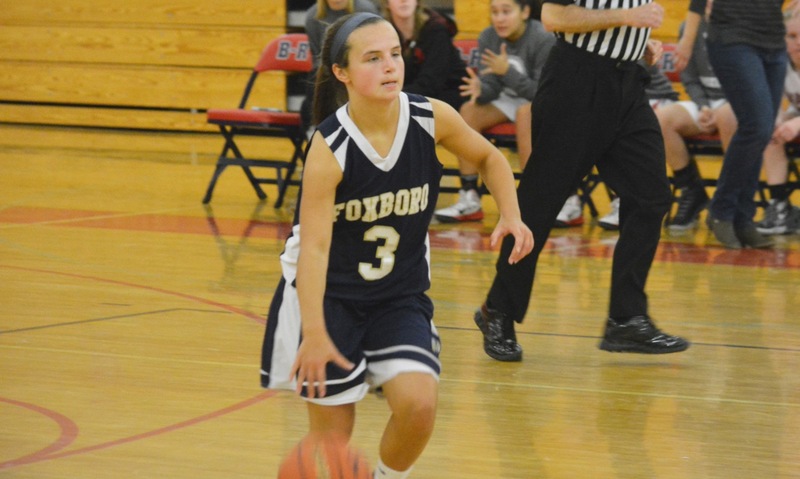 Foxboro, 69 @ Canton, 31 – Final – Ashley Sampson scored a game-high 20 points for the Warriors. Hailey Maling added 15 and Grace Tamulionis had 10 for Foxboro. Hannah Jerrier scored 11 points and Emma Murphy added 10 for the Bulldogs. Mansfield, 60 @ King Philip, 28 – Final – Jen Peel was the top scorer with 18 points in the win. Ann Maher and Maggie Danehy each chipped in with nine points apiece and Meg Hill had six points and 12 rebounds for the Hornets. 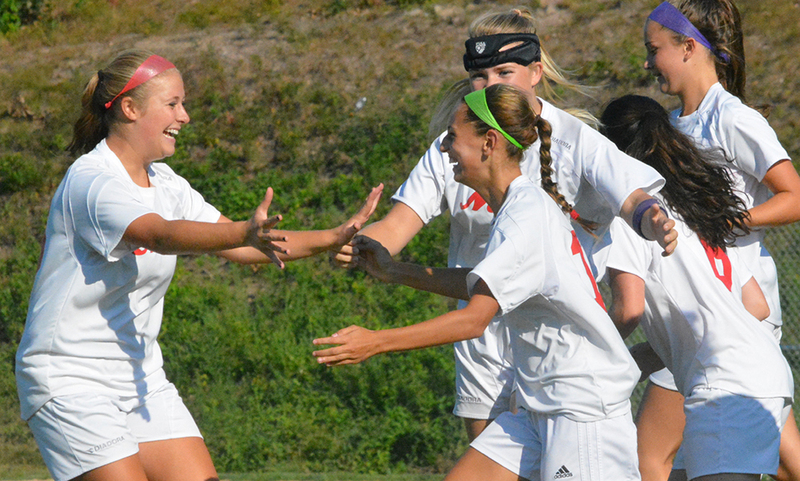 KP was led by Julia Leroux and Christina Hathaway, who both scored eight points. Milford, 45 @ North Attleboro, 51 – Final – Click here for a recap from this game. Oliver Ames, 57 @ Taunton, 20 – Final – Oliver Ames build a 24-6 lead at halftime and never looked back. Kayla Raymond led OA with 15 points and seven rebounds while Abby Reardon added eight points and four assists. 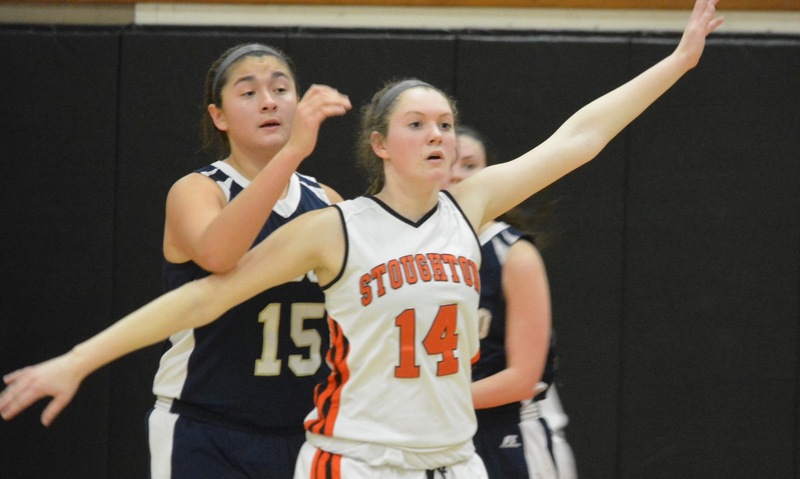 Sharon, 29 @ Stoughton, 43 – Final – Jordan Motley and Val Whalen each had double-doubles for the Black Knights. Motley had 11 points and 23 rebounds and Whalen scored 12 points and pulled down 18 boards. Sharon sophomore Emma Eberhardt scored a team-high 15 points for the Eagles. BRIDGEWATER, Mass. – After taking all of Christmas break off and not playing for 17 days, Foxboro is in the midst of a busy stretch of basketball and on Monday night traveled to Bridgewater-Raynham for a non-league matchup against the Trojans. The Warriors were clearly the more talented team and took a big lead into halftime but came out sluggish to start the third quarter, allowing the hosts to go on a 7-2 run that cut the lead to 14 points and forced head coach Lisa Downs into a timeout. Downs was able to wake Foxboro up from its halftime slumber and the Warriors scored 15 of the next 19 points to take back control and head into the fourth with a 25-point advantage. Foxboro cruised to a 65-36, extending its win streak to four games since a season-opening loss to Mansfield and made it three straight wins by more than 20 points. The Warriors came out with typical intensity on the defensive side of the floor and held the Trojans to only one made field goal in the first quarter and only three for the entire first half, but they were also committing fouls and sent B-R to the line 12 times. Junior guard Ashley Sampson missed almost the entire first quarter after picking up a second early foul. It took the Warriors time to get going offensively without Sampson, but Grace Tamulionis (eight points, seven rebounds) knocked down a jumper and scored on a drive down the lane. Lauren Flahive also came off the bench to score four of her eight points, both on pump-fakes and drives to the basket. Leading 11-4 after the first, Foxboro brought Sampson back in for the second and the offense exploded for 22 points. Sampson (game-high 16 points) got it started with a bucket in transition and then buried a three off a Lily Sykes assist. Sykes (15 points) followed it with a score plus the foul to cap a 9-0 run. Sykes would assist on a Tamulionis corner three and then Hailey Maling kicked it out to Sykes for another three and a 33-14 halftime advantage. The intensity that the Warriors showed in the early part of the game was mimicked by the Trojans at the start of the second half. B-R went into a full-court press and Foxboro seemed rattled by it, struggling to get the ball up the court and turning it over frequently. B-R went on a 7-2 run to cut the lead to 35-21 before Downs called a timeout. Sampson scored back-to-back baskets out of the timeout to restore an 18-point lead and sparked another Foxboro run that had the Warriors doubling up the Trojans heading to the fourth. Flahive scored on a layup, Riley Collins (10 points) finished a three-point play on the break and then Sykes closed the quarter with a corner three off a Tamulionis assist and another from deep off an assist by Shannon Smally. 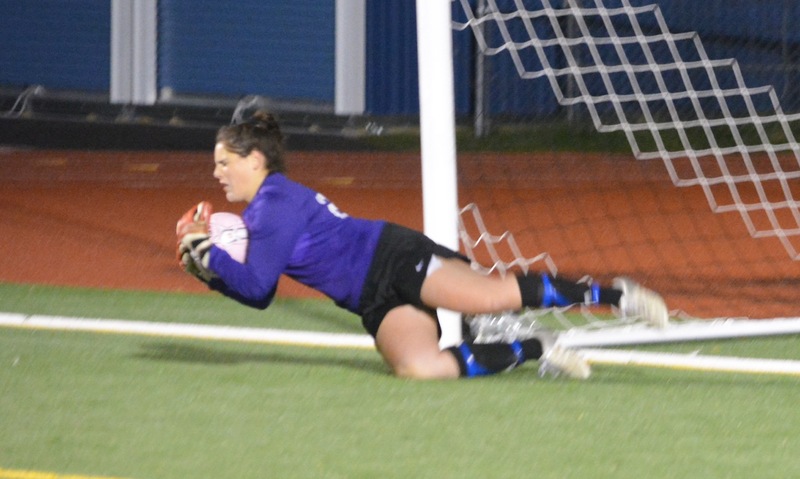 Collins started the fourth with a shot from long distance and then Kristen Bortolotti followed with a three as well, as the game turned into a rout. The Warriors are not the biggest team but they were able to hold their own on the glass, pulling down one fewer rebound than the Trojans on the night. It is a key component to the defensive effort and Downs was happy to see players like Flahive, Sykes (five rebounds), and Sampson (seven rebounds) get involved. Foxboro (4-1) will return to league play on Tuesday night when it hosts Stoughton. #3 Franklin, 62 vs. #6 Westford Academy, 60 – Final – Freshman Jay Dieterle tied a career-high with 24 points to pace the Panthers’ offense. Senior Kevin Gill broke the tie with a layup with 15 seconds to play. Senior Tim Prunier had 12 points and also came away with a big steal in the final minutes to prevent an easy basket from WA. Franklin will play #7 Framingham on Saturday at 5:00 at WPI. #6 Mansfield, 40 @ #3 Newton South, 37 – Final – Meg Hill had a career-high 24 points for the Hornets. Jackie Carchedi added nine points for Mansfield and Caroline Maher hit two clutch free throws in the closing seconds. Mansfield will face No. 2 seed Bishop Feehan in the D1 South semifinal. 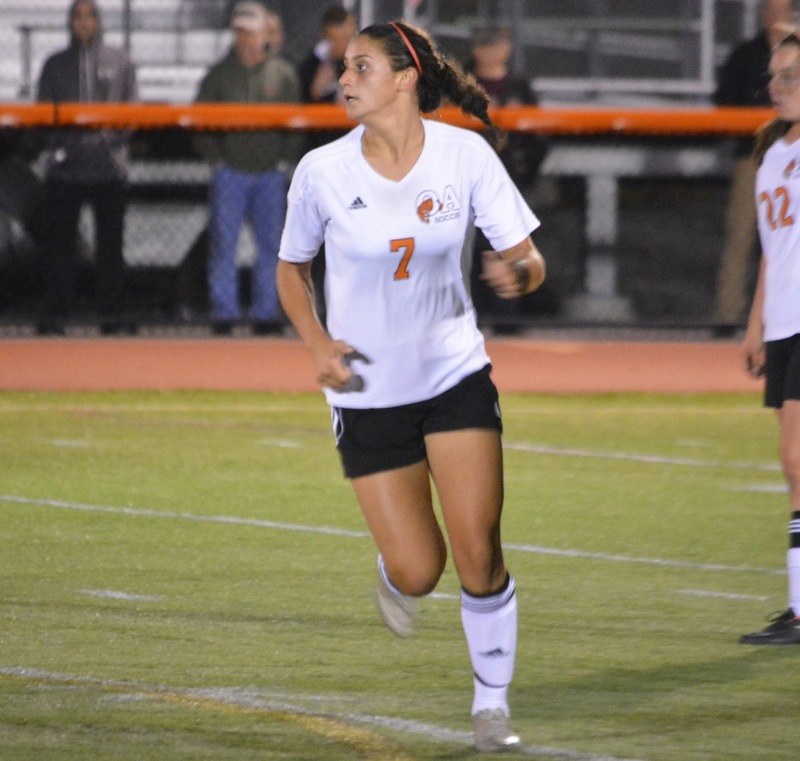 #15 North Attleboro, 46 @ #2 Oliver Ames, 47 – Final – The Tigers host No. 7 seed Notre Dame Academy on Saturday. 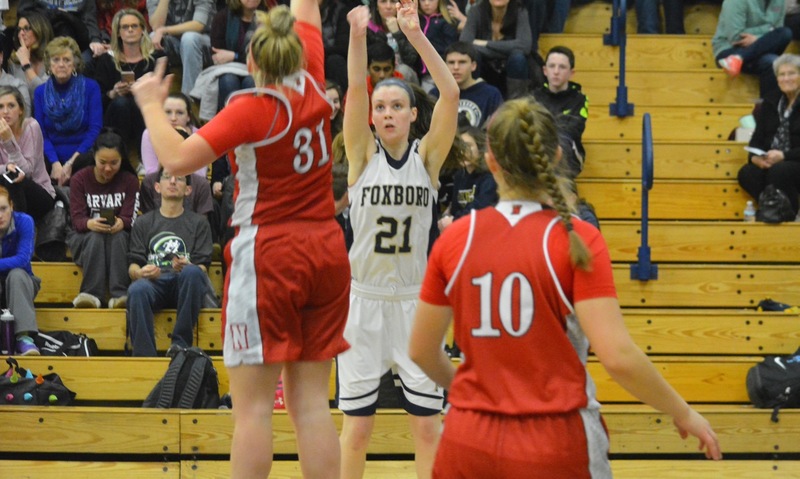 #6 Foxboro, 75 vs. #11 O’Bryant, 28 – Final – Cassidy Harrison led a balanced offensive attack with a team-high 15 points, Ashley Sampson and Grace Tamulionis each had 13 points and Hailey Maling added 12 points. The Warriors travel to No. 3 seed Falmouth on Saturday.